The roots of mangrove trees are seen along a river in Pitas, Sabah, Malaysia, July 6, 2018. PURU NI TIMBUL, MALAYSIA — Swinging his machete with an economy of movement that only the jungle can teach, Matakin Bondien lopped a stray branch from the path of his boat. He hopped barefoot from the prow, climbed a muddy slope and stared once more at what he'd lost. 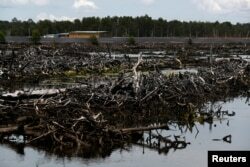 A view of a destroyed mangrove forest outside the Sunlight Seafood shrimp farm in Pitas, Sabah, Malaysia, July 6, 2018. "Do you think we can find any food in this place now?" asked Bondien, a village leader of the Tombonuo people. "The company thinks it can do anything it wants — that we don't count." The company is Sunlight Inno Seafood. 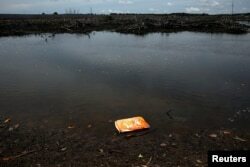 Owned by Cedric Wong King Ti, a Malaysian businessman known as "King Wong," it has bulldozed swaths of mangroves in the Tombonuo's homeland in northern Borneo to make space for plastic-lined ponds filled with millions of king prawns. 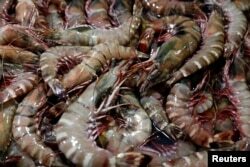 The shrimp are destined to be fattened for three months, scooped up in nets, quick-frozen, packed into 40-foot refrigerated containers and loaded onto cargo ships bound for distant ports. Shrimps are seen displayed for sale at the Filipino Market in Kota Kinabalu, Sabah, Malaysia, July 4, 2018. Gargantuan as it may seem to Bondien and his relatives, the project represents only a speck in the global aquaculture industry, one of the world's fastest-growing sources of protein. Unfolding across Asia and around the world, this revolution in farming could help mitigate the impacts of climate change — or make them even worse. "If you ask me what is the No. 1 concern that I have on climate change effects on fisheries, it is on these tropical, developing countries," said William Cheung, director of science at the Nippon Foundation-University of British Columbia Nereus Program. "The sheer speed of the change will make it that much harder for marine life to adapt." Coral reefs, as vital to tropical fish as trees are to birds, are becoming more vulnerable to a process called bleaching, which occurs when a spike in water temperatures causes coral to expel the algae that provide their kaleidoscopic colors, leaving them prone to starvation or disease. Today, swaths of the once-psychedelic Great Barrier Reef in Australia have turned boneyard white and largely devoid of life. Scientists fear a similar fate could await the Coral Triangle, a huge underwater wonderland east of Borneo endowed with a trove of biodiversity comparable to the rainforests of the Amazon Basin. Millions of people depend on its bounty to survive, a large share of them Malaysians, who eat an average of 125 pounds of fish each a year — more than double the world average. Farther to the north on Borneo, an island divided among Malaysia, Indonesia and Brunei, villagers are raising sea cucumbers: curious-looking creatures resembling giant slugs that are typically braised and served with oysters, mushrooms and spring onions, or — if you're in Japan — thinly sliced, flavored with wasabi and eaten raw. 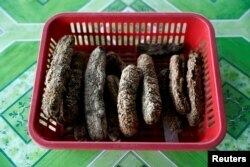 A basket of dried sea cucumbers is seen in Mapan Mapan, Sabah, Malaysia, July 7, 2018. A couple of hours' drive from the Sunlight Seafood shrimp farm, inhabitants of the stilted village of Mapan Mapan have created a maze of sunken enclosures fenced with a barnacle-covered mesh. Immersed waist-deep in one of these briny paddocks, sea-cucumber farmer Astinah Binti Jamari plucked one of the sandpaper-skinned creatures from the seabed. It responded by squirting her with a jet of saltwater — a defense normally used to scare away crabs. 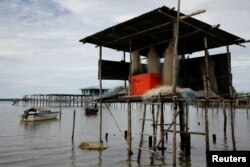 Forty years ago, only 5 percent of the world's fish production was farmed. After decades of rapid growth, aquaculture reached a tipping point in 2013, according to the U.N. Food and Agriculture Organization, when the amount the industry raised in cages, tanks and ponds outweighed the tonnage of freely swimming fish hauled from lakes, rivers and seas for people's plates. Fishing nets hang from a shack in a village farming sea cucumber in Mapan Mapan, Sabah, Malaysia, July 7, 2018. ​In many respects, the industry has a good-news story to tell. Farmed salmon, for example, can convert feed into edible protein far more efficiently than cows or pigs, while producing fewer greenhouse gases. Now, almost all the salmon sold in restaurants and supermarkets is raised in captivity, with Norway, Chile and Scotland the biggest producers. But this phenomenal expansion has come at a cost. The appetite for farmed species is so voracious, almost 20 percent of the annual catch from the world's seas is ground into fishmeal, a nutrient-rich powder that forms the basis of the feeds used from salmon cages in Scottish lochs to shrimp ponds on Borneo. Vast amounts of fish have been taken from poorer countries to feed species destined for the plates of wealthier consumers. In addition, shrimp farms, in particular, have made coastal communities in the tropics even more vulnerable by cutting down mangroves, their first line of defense against extreme weather and rising sea levels. Five years since the bulldozers went to work, Tombonuo community leaders say they've lost more than 2,000 acres of mangroves and that the jobs and infrastructure they were promised haven't materialized. "I have no words. It's like we've lost our whole world," said Samad Samayong, a Tombonuo elder, surveying a sacred outcrop consecrated by his ancestors that is now encircled by shrimp ponds. "We only realized what was happening when it was too late." Sunlight Seafood didn't respond to Reuters’ requests for comment made by telephone, email and a letter hand-delivered to its office in Kota Kinabalu, the capital of Sabah. Reuters also contacted a law firm in Kuala Lumpur, the Malaysian capital, that had acted for the company in the past but received no reply. The Sabah Environmental Protection Association, a nongovernmental organization, says Sunlight Seafood has already cut down 2,300 acres of mangroves, citing satellite imagery. 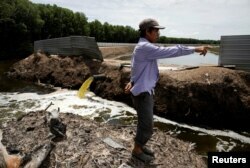 Village leader Matakin Bondien inspects a stream of wastewater discharged from the Sunlight Seafood shrimp farm in Pitas, Sabah, Malaysia, July 6, 2018. A farmer holds oysters grown at a floating farm in Tuaran, Sabah, Malaysia, July 8, 2018. Sabah's government says it is committed to striking a balance between economic development and preserving Borneo's extraordinary natural heritage, including by designating extensive areas of forest as nature reserves for threatened orangutans and creating Malaysia's largest marine protected area. In July, a Reuters reporter visited Sunlight Seafood's offices in a suburb of Kota Kinabalu and hand-delivered a letter summarizing the Tombonuo community's grievances and requesting an interview with owner Wong or another company representative. While the reporter was explaining the purpose of the letter to a worker who had been sent to meet him at the door, a security guard cut their conversation short and escorted the reporter off the premises. The guard then closed the gate to the driveway. It bore a large sign in red letters warning that trespassers would be prosecuted. A villager cleans a sea cucumber outside her house in Mapan Mapan, Sabah, Malaysia, July 7, 2018. Nestled in sea-cucumber farmer Jamari's palm, the specimen she had fished from the seabed convulsed with a slow-motion shudder. Jamari, once a struggling single parent, says the creatures came to her rescue, earning her enough money to put her five children through school and build a new house. 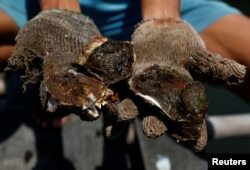 Chinese traders have been importing sea cucumbers for more than a thousand years. Served at royal banquets, they were considered both a status symbol and an aphrodisiac. A Ming Dynasty book published in 1602 called "Miscellanies of Five Items" lists them as "sea ginseng." This mystique drives much of the appetite today. In the decade that ended in 2016, global production of sea cucumbers more than doubled to nearly 275,000 tons, according to the FAO. At top Chinese restaurants, the echinoderms are used to make one of the world's most expensive soups, a broth called Buddha Jumps Over the Wall that can sell for $400 and needs to be ordered five days in advance. Irwin Wong is a manager at Oceandrive, a Malaysian seafood company that buys the sea cucumbers for export. He served as an adviser when Mapan Mapan started cultivating the creatures eight years ago in a 20-farmer pilot project backed by the local government. He says the scheme is harvesting wild sea cucumbers at a sustainable rate, but that even better management could help Borneo produce many more. Researchers believe there is enormous potential to scale up global production of plankton-eaters such as scallops, clams, oysters, cockles and other bivalves — and, of course, sea cucumbers. 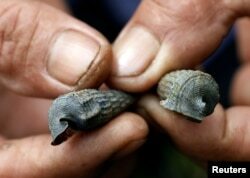 A villager holds edible snails known as singor, found in mangrove forests in Pitas, Sabah, Malaysia, July 6, 2018. "The current way of feeding ourselves is simply not sustainable," said Sebastian Ferse, an ecologist at the Leibniz Center for Tropical Marine Research in Bremen, Germany. "I think on a global level we have to start thinking about the lower levels of the marine food chain, such as bivalves, when it comes to supplying our proteins." Scientific advisers to the European Union agree. They concluded last year that it should be possible to harvest a combined 165 million tons annually of bivalves and seaweed — almost double the world's annual landings of wild-caught fish. The beauty of these creatures is that, unlike farmed fish or prawns, they don't require any feed apart from the nutrients they absorb from the sea. No mangroves have to be felled to culture them. Neither do they spew tons of fish waste or chemical pollutants. In fact, bivalves actually remove toxins from the water; a single oyster filters 50 gallons of seawater a day. A worker feeds giant groupers at the Borneo Marine Research Institute hatchery in Kota Kinabalu, Sabah, Malaysia, July 9, 2018. Their wild relatives will have to work a lot harder to survive. In experiments to simulate the effects of more acidic waters, the institute has found that grouper — a staple in the Coral Triangle — find it harder to reproduce, and their young don't develop properly. The findings have sharpened concerns about what climate change will mean for the region's marine life, already struggling with plastic pollution, runoff from oil palm plantations, damage to reefs by dynamite fishing and the loss of mangroves. Shek Qin, a research assistant, visits the busy fish-landing quay at Kota Kinabalu two nights a week to monitor catches of sharks and rays. In the early hours of a July morning, she picked up a newly landed shark by its tail, plonked it onto the dock and cheerfully inserted her forefinger into its mouth, peering inside to inspect the teeth — a trick for classifying a specimen more accurately, especially if fishermen have lopped off the fins. "It's a whole food web: If one species is declining, others will get affected, too," Qin said, cradling a recently deceased hammerhead. "That's why we need to preserve every species of fish." 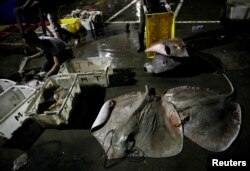 A man sorts stingrays landed by fishermen at a quay in Kota Kinabalu, Malaysia, July 5, 2018. Near the fence surrounding the Sunlight Seafood shrimp farm, villagers Bondien and Samayong moored their flotilla under some mangrove trees and cast lead-weighted hooks. Samayong's daughter Ida remembered her grandfather regaling her with tales of the monster fish of his youth — notably, a ray he once caught that was bigger than his boat. But that day, nothing came to nibble. "You used to be able to catch a fish here in 10 minutes," said Bondien, his line slack in the water. "Now, even if you have good bait, you can wait an hour and get only one — maybe nothing." An empty bag of shrimp feed floats on the surface of a stream outside the Sunlight Seafood shrimp farm in Pitas, Sabah, Malaysia, July 6, 2018. Around a bend in the river, an empty bag of Royal Dragon feed had become snagged in some mangrove branches. It was emblazoned with an image of a shrimp.